I would consider this to be "the star of the show" for serving at any festive holiday occasion. It certainly makes a grand impression for either a very special Christmas, Hanukkah or Kwanzaa dessert. Your guests will be so impressed. You will need a 2 1/2 quart (litre) trifle bowl or other flat-bottomed clear glass bowl. Prepare the Vanilla Custard or Vanilla Pudding Mix, if using. (See recipe below for Vanilla Custard). If you are making the Vanilla Pudding Mix, let cool before using, or chill Vanilla Custard in fridge for 4-6 hours before using in recipe. Of course, if using the Bird's ready-made custard, there is no preparation, just use in recipe at room temperature. Put the dried cherries in a small bowl and add boiling water to cover. Let stand for at least 30 minutes to plump the cherries. Drain. Reserve about 2 tbsp. of the cherries for garnish. Peel the pears, halve lengthwise, core and cut the pears crosswise into thin slices. Put them in a bowl, add the lemon juice and toss to coat. In a small bowl, combine the jam with the warm water and stir. Reserve about 2 tbsp. of the almonds for garnish. Cut the sponge cake (or pound cake, if using) into slices 1/2 inch thick. 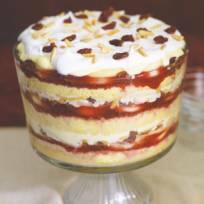 In a 2 1/2-quart trifle dish or deep glass bowl, make a layer of one-third of the cake slices, cutting and fitting them together as necessary. Sprinkle the cake layer with one-third of the sherry. Dollop one-third of the jam mixture over the cake. Sprinkle the jam with one-third each of the pears, cherries and almonds, in that order. Pour 1 1/3 cups of the vanilla custard (or vanilla pudding) over the top. Repeat to make 2 more layers. Cover the bowl with plastic wrap and refrigerate the trifle for at least 2 hours or up to overnight. About 30 minutes before serving, make the whipped cream: In a deep bowl, using a balloon whisk, beat the cream, confectioners' sugar and vanilla until soft peaks form. Spoon the cream over the top of the trifle. Garnish with the reserved cherries and almonds. Let stand at room temperature for about 30 minutes. To serve, scoop out large spoonfuls, going down to the bottom layer. In a medium size heavy saucepan, stir the sugar, flour, ground nutmeg and salt. Gradually stir in milk, egg yolks and vanilla extract. Cook over medium heat, stirring constantly until thickened and bubbly. Cook and stir for 2 minutes more. Remove from heat. Pour into bowl; cover surface with plastic wrap and refrigerate for 4-6 hours. Vanilla pudding mix may be substituted for the custard in this recipe. Use the larger size box of pudding mix (4.3 oz. size), and follow directions on pudding box to prepare pudding. Let pudding cool before layering the trifle. Also, store-bought ready-made custard may be used. If you are going to use vanilla pudding mix or ready-made custard instead of making the homemade custard, then making it the same day will be fine, otherwise the homemade vanilla custard should be made the day before preparing the trifle. To toast the slivered almonds, in a small, dry fry pan over medium-low heat, stir the almonds frequently until they are fragrant and begin to turn golden brown, 2 to 3 minutes. Immediately transfer to a bowl and let cool. Your trifle was a hit at Christmas with my family. They loved it. Brilliant! I took it to a party with my friends and it was gone the second it touched the table! They all loved it!